It seems we have been having a record wet winter season here in Arizona. As a result, it has delayed some of my projects, and caused others to be expanded. In the spirit of change, I have redisigned the EZ CANOE to be more technically current, and a little more roomy. 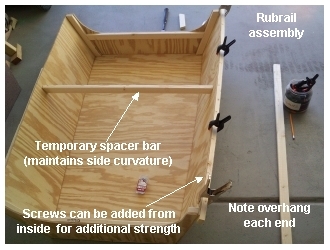 It now employs features I find to be easier to assemble, and at the same time provides a more durable little boat. Of course it is of a portable design, much like it's predecessor. Composed of 3 modules that bolt together, and employing optional buoyancy compartments, it becomes an 11 foot long, easy to paddle canoe style craft. Nested, it sits in a space only 4 feet long, 34 inches wide and 16 inches high. Small enough to fit in almost any vehicle. The finished weight is still under 50 pounds, easy for almost everyone to lift. And, with a slightly truncated stern, a trolling motor could easily be affixed with the addition of a mount. It's new name is the 'EZ 2' Canoe. Much of the change in design is an outgrowth of the newer boats I have recently designed and built. I have settled in on a construction method that pretty much forms the hull shape without fancy forms or complicated dimensioning. The bolt-together modules seem to be what builders prefer, and small decks provide necessary dry storage areas. 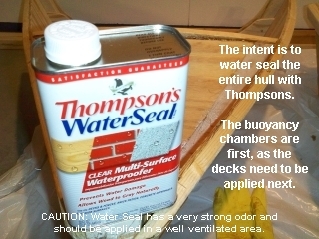 Also, I am now recommending that the entire hull, inside and out, be treated with Thompsons waterproofing prior to finishing. This is a direct result of not being able to easily secure quality plywood. My most recent boat was built with inexpensive ACX plywood, treated this way, and after a few excursions to the lake, has proven to be very water resistant. 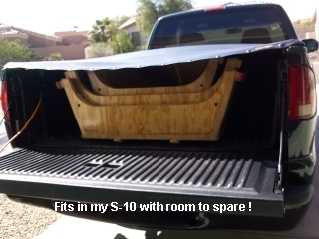 However, as with most of my designs, fiberglassing the exterior is always an option. This would produce a craft that was capable of much rougher waters, as opposed to the recommended calmer ponds and lakes of the plywood only versions. 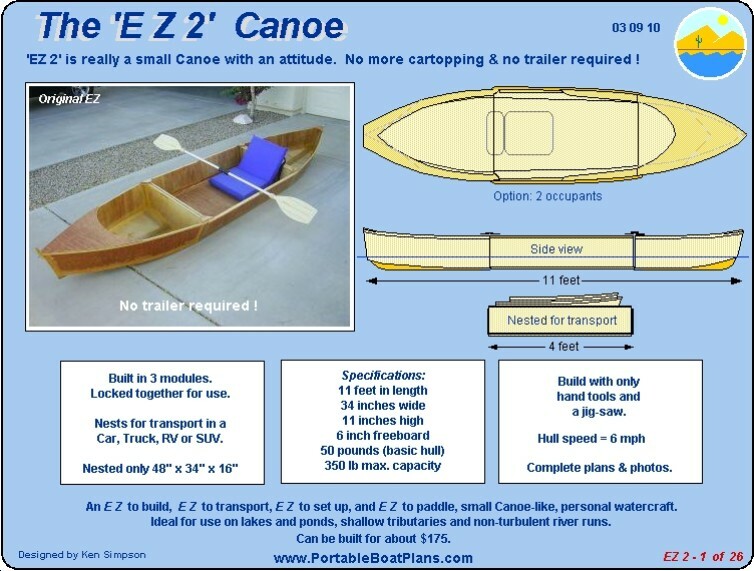 The 'EZ 2 Canoe' plans are now available, and are attached for your review. It is my opinion that the new design will satisfy a broader spectrum of builders, as it now can seat 2 in tandem, as long as the combined load does not exceed the 350 pound capacity. Also, the turnaround time to build should be less, which translates to an earlier launch date. 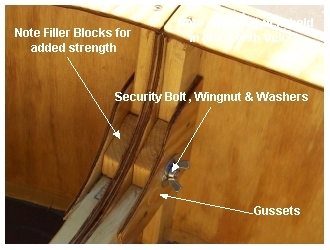 These photos typify the basic building technique used for the EZ-2 CANOE. Shown is the Center Module with skids & rubrails being attached. 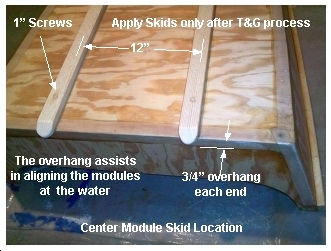 One of the more dramatic changes to the design is the stronger method of hull section attachment using 3/8 inch bolts. Due to poor availability of good plywood, I have added water sealing to the entire hull, inside and out, to prevent long term water damage. This is a typical view of the transportable ease of the EZ-2 CANOE. Return to top of this page for the Main Menu and Plans Ordering Information. Thank you for your interest in my portable boat plans. 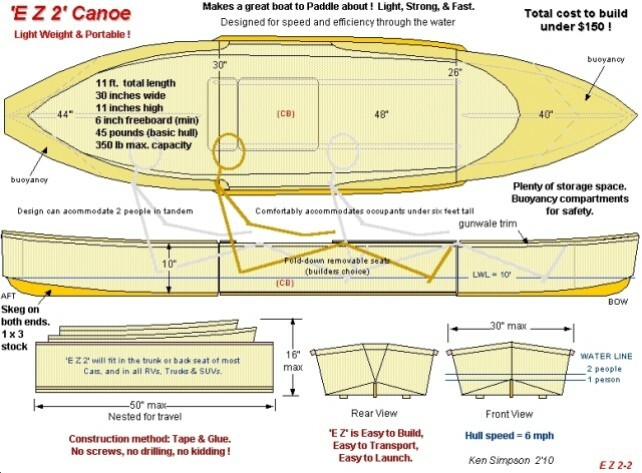 PS: If you bought the plans of the original EZ Canoe, and have not yet built it, I will send you this updated version FREE. Just send me an e-mail, with your name and location (City, State, or Country), requesting the EZ-2 CANOE plans.